JJC FW Series Filter Wrench is specially designed for removing jammed or over-tightened filters from your lens. The filter wrench is ideal for detaching all kinds of filters, including UV, CPL, ND, etc. This series filter wrenches is made of ABS material, lightweight and compact. The squeeze-type design ensures comfort and grip for ease of use. There are two filter wrenches in one package. Generally, one wrench is enough to remove a filter. But when a filter is over-tightened, two wrenches used together will be more helpful. You can use one to hold the lens, and the other to rotate and remove the filter. In this way, it reduces the risk of damage to your lenses and filters during detachment. 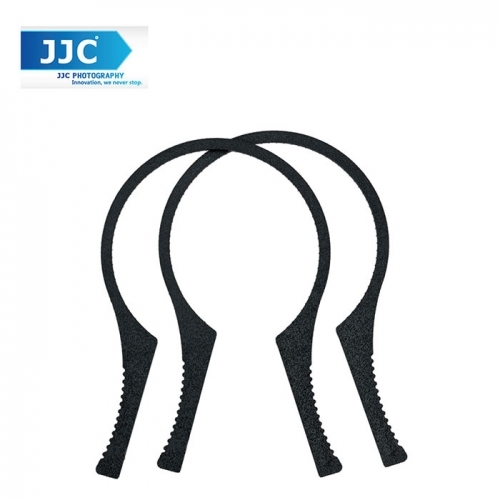 JJC FW-4662 filter wrench is compatible with filters ranging from 46mm-62mm in diameter and FW-6786 is for filters ranging from 67mm-86mm in diameter.